Holbein Duo Aqua Oil Mediums were designed specifically for use with Duo Aqua Oil Colors. Use them to enhance transparency or translucency, create a gloss or matte finish, accelerate drying time, or aid brushability and flow. All may be thinned with water and dry clear. Stand Linseed Oil — This is a highly viscous, thermal polymerized linseed oil that increases the transparency of Duo Aqua Oil Colors. It produces a leveled, enamel gloss effect with an elastic, durable film when mixed with Duo Aqua Oil Colors or Duo Painting Oil Medium. It can be thinned with water; the resulting milky appearance will become clear when dry. While Duo Stand Linseed Oil may become cloudy over time, its performance is not affected. Linseed Oil — This is a linseed oil that increases the transparency and gloss finish of Duo Aqua Oil Colors while slowing drying time. It can be thinned with water; the resulting milky appearance will become clear when dry. 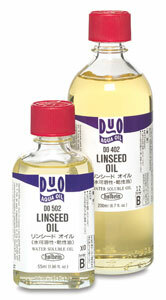 While Duo Linseed Oil may become cloudy over time, its performance is not affected. Quick Drying Medium Matte Paste — This is an aqueous paste medium that results in a translucent, matte finish while dramatically accelerating drying time. The matte effect varies from color to color. When mixed with Duo Aqua Oil Colors in equal parts, the substrate surface becomes tacky in approximately 30 minutes. It can be thinned with water, reducing the matte effect; the resulting milky appearance becomes clear when dry. Thick layers may cause wrinkling. Quick Drying Medium Gloss Paste — This is an aqueous paste medium that results in a transparent and gloss finish while dramatically accelerating drying time. When mixing with Duo Aqua Oil Colors in equal parts, the substrate surface becomes tacky in approximately 30 minutes. It can be thinned with water, reducing the gloss effect; the resulting milky appearance becomes clear when dry. Thick layers may cause wrinkling. Quick Drying Liquid — This liquid enhances transparency and gloss finish while dramatically accelerating drying time. When mixed with Duo Aqua Oil Colors in equal parts (do not exceed a 50/50 mix), the substrate surface will become tacky in approximately 30 minutes. Quick Drying Liquid can be thinned with water; the resulting milky appearance becomes clear when dry. While it may become cloudy over time, its performance is not affected. It is excellent for knife painting and impasto. Painting Oil Medium — This medium enhances transparency and gloss finish while accelerating drying time. It can also be added for a stronger surface finish during final layers of painting. Because it aids in brushability and flow, it’s great for detail work. Use it alone or thin it with water; the milky appearance that results becomes clear when dry. While it may become cloudy over time, its performance is not affected. Store in a cool, dark place.